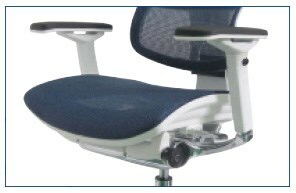 Look for adjustable seat and back angle height and depth in order to conform to your torso. Chairs with more adjustments have a higher likelihood of providing the settings you need most. Adjustable arms are an important feature because everyone's arms are different lengths and fall at their sides in relation to the torso differently. Your arms should be able to rest parallel to the floor without putting undue pressure on your wrists and elbows. You will notice a substantial difference in your comfort level. Try a chair with a high back and a padded head rest. This will provide more support to the upper back, shoulders and neck reducing the possibility of back and neck pain. Ergonomic chairs will have specific weight limits so choose a chair that offers the correct support for your body weight. Choosing a chair that is not designed to support your weight could cancel out all the positive features of the chair. Try before you buy. Test the comfort of a chair for yourself. By running through the adjustable seat positions and other features to get an idea of what the product offers.